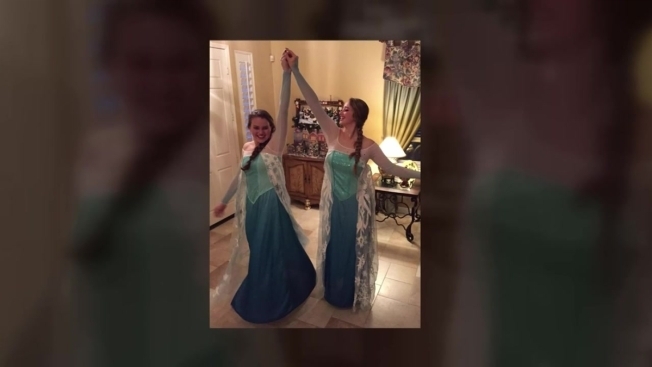 Two San Diego County teens were left disappointed after being turned away from a "Frozen" Disney on Ice show at Valley View Casino for an unlikely and seemingly bizarre reason: they were too tall to be wearing costumes. The girls said security staff told them they could be confused with the performers. "Honestly, more than anything, it was just disappointing," Jessica Mcroskey said. “They came back later and said that 'Yes, you’re under 18, but you’re too tall ... people would actually think that you’re one of the characters,' and I guess there’s an issue with them taking pictures with us or something,” McRoskey said. The teens said they looked again at the fine print on their tickets: Nowhere did it say on the tickets nor the event's website that costumes weren't allowed. When reached for comment, a spokesman for Feld Entertainment, the promoter of the event, told NBC 7 the company doesn’t have a policy against costumes. He said there appeared to be a miscommunication with security guards. The company has offered the girls tickets to a later event. The two best friends are heading to college on opposite coasts next year. "We just want to have as much fun together as we can before we leave, and that was a night we'd been looking forward to for awhile," Wineholt said. "It's definitely a night we won't be able to get back."